for plenty of symbolism to be featured, for example, Hamlet’s suit was littered with motifs such as crowns which made an exciting visual display. The RSC’s production also included lots of movement, the fight between Laertes (Buom Tihngang) and Hamlet (Paapa Essiedu) used sticks and fire to create tension and a focus on the danger during the play. In addition to this, Hamlet and Ophelia (Mimi Ndiweni) used an intensely physical portrayal of their relationship as Hamlet seemed to threaten a compelling, strong-willed Ophelia as he learned of her betrayal, and Paapa Essiedu emphasised the violence within the play. 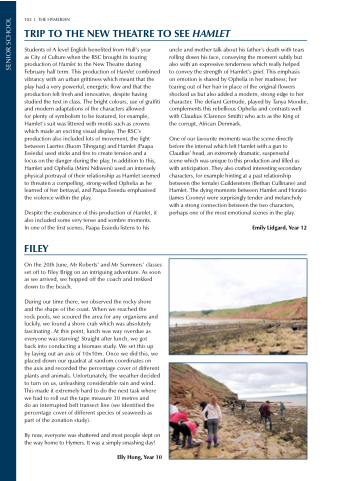 On the 20th June, Mr Roberts’ and Mr Summers’ classes set off to Filey Brigg on an intriguing adventure. As soon as we arrived, we hopped off the coach and trekked down to the beach. rock pools, we scoured the area for any organisms and luckily, we found a shore crab which was absolutely fascinating. At this point, lunch was way overdue as everyone was starving! Straight after lunch, we got back into conducting a biomass study. We set this up by laying out an axis of 10x10m. Once we did this, we placed down our quadrat at random coordinates on the axis and recorded the percentage cover of different plants and animals. Unfortunately, the weather decided to turn on us, unleashing considerable rain and wind. This made it extremely hard to do the next task where we had to roll out the tape measure 30 metres and do an interrupted belt transect line (we identified the percentage cover of different species of seaweeds as part of the zonation study). By now, everyone was shattered and most people slept on the way home to Hymers. It was a simply smashing day! on emotion is shared by Ophelia in her madness; her tearing out of her hair in place of the original flowers shocked us but also added a modern, strong edge to her character. The defiant Gertrude, played by Tanya Moodie, complements this rebellious Ophelia and contrasts well with Claudius (Clarence Smith) who acts as the King of the corrupt, African Denmark. scene which was unique to this production and filled us with anticipation. They also crafted interesting secondary characters, for example hinting at a past relationship between (the female) Guildenstern (Bethan Cullinane) and Hamlet. The dying moments between Hamlet and Horatio (James Cooney) were surprisingly tender and melancholy with a strong connection between the two characters, perhaps one of the most emotional scenes in the play.